Originally housed in the East Asian Library, the East Asian Rare Book Collection was transferred to Rare Books for safe keeping. 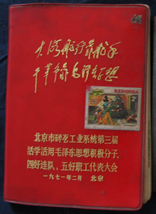 The East Asian Rare Book Collection comprises Chinese and Japanese language rare books.The Chinese material includes 7,000 volumes of oriental-style works dating from the 1600s to 1935, as well as scrolls of painting and calligraphy, magazines published in the 1930s and diaries from the Cultural Revolution period. The East Asian Collection holds some 65 diaries from various periods in the Cultural Revolution. These unpublished manuscripts are mostly personal diaries, with some work diaries, and are important primary sources for this historical period. The Japanese rare collections are particularly strong in history, art, architecture, language learning and teaching and popular culture. There is a comprehensive collection of kokuho shuri hokokusho (restoration reports of 'national treasure' temples and other buildings); items relating to the Kanto Earthquake of 1 September, 1923 (Kanto Daishinsai); pamphlets and booklets advising the populace on how to prepare for American air raids during the Second World War; and ephemera from Japan's occupation of Manchuria in the 1930s. The East Asian Rare Books are available for research use and may be used in the Reading Room on the 3rd floor of the Baillieu Library. To request material, please register and order here.